For each of the last several sessions of Congress, Sen. Tom Carper, D-Del., has committed himself to shepherding a major reform of the U.S. Postal Service to President Obama’s desk. Each effort has fallen short, but his resolve has not waned. In the 114th Congress, Carper is starting from scratch to bring relief to the cash-strapped agency. The problems facing the Postal Service remain the same: a combination of liabilities owed to its increasing cadre of former employees and declining revenue resulting from Americans using the mail less than they have in decades. With limited exceptions, mail volume continues to slide while the burden of future expenditures on former and current workers is not lightened. The problems facing a legislative overhaul too are familiar: a wide array of parochial interests voiced by labor unions, large-scale mailers and rural customers, leading to a clash -- and if history is any indicator, a stalemate -- among the lawmakers representing those interests. What differs this time around is the approach. Aides to Carper -- the leading crusader for postal reform on Capitol Hill for years, especially now that Rep. Darrell Issa, R-Calif., has stepped down from his role as head of the House committee with postal oversight -- tell Government Executive the senator is truly trying to give all members an opportunity to offer their perspectives and help craft legislation. Carper invited Postal Service managers, as well as representatives from the USPS inspector general’s office, Postal Regulatory Commission and Government Accountability Office, for a briefing on postal finances to educate his fellow senators. Now the ranking member of the Homeland Security and Governmental Affairs Committee after Republicans took control of the Senate this year, Carper and the new chairman, Sen. Ron Johnson, R-Wis., both attended the meeting, as did other committee members and presidential candidate Sen. Bernie Sanders, I-Vt. While Carper’s postal bill in the 113th Congress was co-authored by his then-ranking member and since retired-Sen. Tom Coburn, R-Okla., and was received by many as a fair compromise, several members of his own party did not support it. In the past, Carper has received criticism for taking an “insular” approach to crafting postal legislation, something he has done in each of the last two sessions of Congress. With more roundtables to come Carper is promising a different strategy this time around. Currently on the schedule is a meeting to discuss USPS’ challenges and opportunities in the digital age. 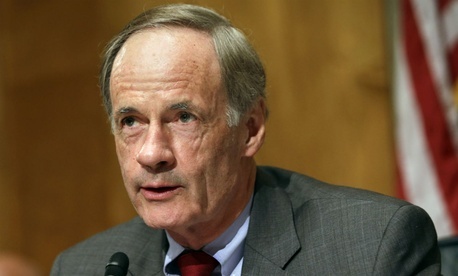 Carper recently joined the Democratic caucus, and a majority of Republicans, in supporting an amendment to the budget that advised the Postal Service to delay the facility closures scheduled for this year. The consolidations were a major sticking point for Democrats in the last Congress. The Carper-Coburn bill, which cleared committee but never received a vote on the Senate floor, would have delayed the closures temporarily. The senators penned a letter to congressional appropriators as they were crafting the fiscal 2015 funding measure advising the budgeters to ignore calls for language in the spending bill specifically prohibiting USPS from moving forward with its consolidation plan. This time around, Carper helped craft the closure moratorium amendment with Sanders. The non-binding provision passed last month with 85 votes. As it has done for years, the Postal Service is attempting to right its fiscal ship, to the extent that it can, without Congress’ help. In addition to “right-sizing” its network with the consolidations, USPS is looking to grow revenues by investing in new business opportunities. Just this week, the Postal Service held a symposium to discuss new innovations and possibilities for delivery. Postal revenues have increased in recent months, and last quarter the agency actually turned a $1.1 billion operational profit. A lot of that success, however, is due to an emergency rate increase set to expire this summer. A Carper aide said the recent positive news has not changed the senator’s perspective. “He’s still working at the same rate, the same energy level,” to pass legislation, the aide said. He added he has no timeline for introducing a bill, but he hopes it will again be a bipartisan effort. After years of near misses, there could be room for optimism this time around: Carper has held dialogues with new House Oversight and Government Reform Committee Chairman Jason Chaffetz, R-Utah, and hopes to have everyone “in sync” at some point in the months to come. In addition to new congressional leadership, the Postal Service has a new postmaster general in Megan Brennan, and mailing groups appear more eager to work with her than her predecessor.